The preparation and implementation of the new EU 2020 Strategy requires realistic evaluation of the initial position including past performance, better transparency and more effective co-ordination at the EU and national levels. By 2008 the actual developments were lagging behind the respective lines to the Lisbon targets by 2.7 years for dynamics of GDP, for 3.1 years for total employment rate and for more than 7 years for the share of R&D in GDP (delay of seven years in an eight year period!). This is a much more transparent way of monitoring the implementation for governments and civil society that can help to bring about continuous policy adjustments than the statistical format of presentation in the Commission reports. The analysis of implementation is much more interesting also in political terms when it is made against the national targets. 1. One has to start from a realistic evaluation of the initial position and of past performance. 2. For efficient implementation much better co-ordination is needed. 3. Much greater transparency is needed both in setting up the strategy and in its continuous monitoring. 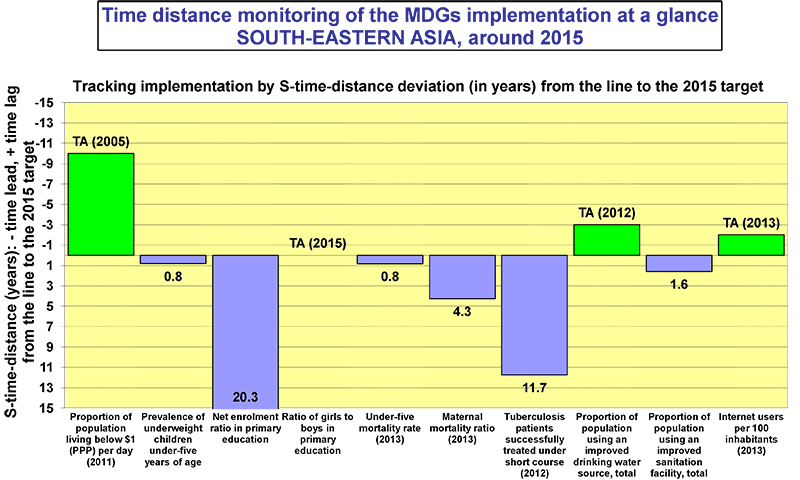 The benefits of the new S-time-distance view in comparisons, competitiveness issues, benchmarking, target setting and monitoring for economic, employment, social, R&D and environment indicators at the world, EU, country, regional, city, sector, socio-economic groups, company, project, household and individual levels could be immediately applied to many indicators from a wide variety of substantive fields using existing data and indicator systems from international, national, regional, business and local sources. “But I want to go further. We need to match this huge investment in ex ante assessment with an equivalent effort in ex post evaluation – to ensure that our proposals really do deliver what they promise and to enable us to revise and correct them where they fail to work as expected. All of these initiatives are designed to focus EU action on the essentials, removing bureaucratic processes and unnecessary centralisation“ (Barroso, 2009, p. 29). These political guidelines should be applied right now for a thorough ex post analysis of implementation at EU and country levels to benefit from the lessons learned from the ongoing Lisbon Strategy and not just proclaimed and reserved for some undefined distant future. The time distance methodology can make a modest contribution in the consultation process by presenting the situation in transparent terms with clear interpretability both to decision makers and to the general public, which can as well facilitate understanding, commitment and broader participation in the preparation of the EU 2020 Strategy.